SKU: GP100K. Categories: Floor Scale, Industrial. 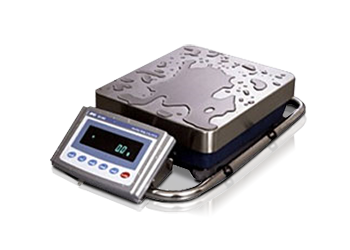 The GP Series incorporates our enhanced weighing sensor, the Double Leveraged Super Hybrid Sensor(SHS). Building on the basic SHS features of speed and stabilization, our enhanced SHS technology brings the most accurate weighing results to industrial balances in the 12 kg to 101 kg capacities class. Standard WinCT WinCT (Windows Communication Tools Software), provides easy transmission of weighing data from A&D balances to a computer using the RS-232C interface. Speed of data transfer into Windows applications in a manageable format is limited only by the computer’s capabilities. RS-232C Interface Using a USB/RS-232C Converter, you can transfer data between a USB-equipped PC and a GP balance. This also makes your GP balance hot-swappable meaning that there is no need to turn the balance and/or computer off before disconnecting the balance. The World’s Most User-Friendly Industrial Balances! The GP internal calibration with an internal mass saves time and money. External calibration requires a great deal of skill, time and an expensive external mass. With our internal calibration with internal mass, the balance is calibrated very quickly. ■ Automatic Self Calibration — Self-calibrates automatically when the balance detects ambient temperature changes. ■ One Touch Automatic Calibration — Allows you to calibrate the balance on demand with just the push of a button. ■ Calibration is essential for accuracy in weighing. For example, in high resolution balances, changes in sensitivity drift can be caused by changes in the ambient temperature. Take the GP-30K for example, the weight might change by 0.9g with a change of 10˚C (Sample’s weight: 30kg). ■ Thanks to our Double Leveraged Super Hybrid Sensor, the GP’s motor-driven internal calibration mass is equivalent to a 50kg calibration mass in terms of top loading capacity on the weighing pan.